A TORONTO SYMPHONY Launches CONSTELLATION Web App!! It has been a very exciting week for the A Toronto Symphony project. We launched our Media Scores app and have received dozens of wonderful contributions and comments from many of you. We had a truly wonderful session last week with school kids from around Toronto who shared their exciting Hyperscore compositions created for the project, many of them performed by musicians from the Toronto Symphony Youth Orchestra. Today we are delighted to launch a brand new web app that offers a completely different way for you to contribute to the creative process of A Toronto Symphony. CONSTELLATION has been designed especially for A Toronto Symphony by Akito Van Troyer and my team at the MIT Media Lab. Like Media Scores, Constellation lets you take material I have composed for the piece and then reshape, modify, morph and personalize it to create the version that you like best. 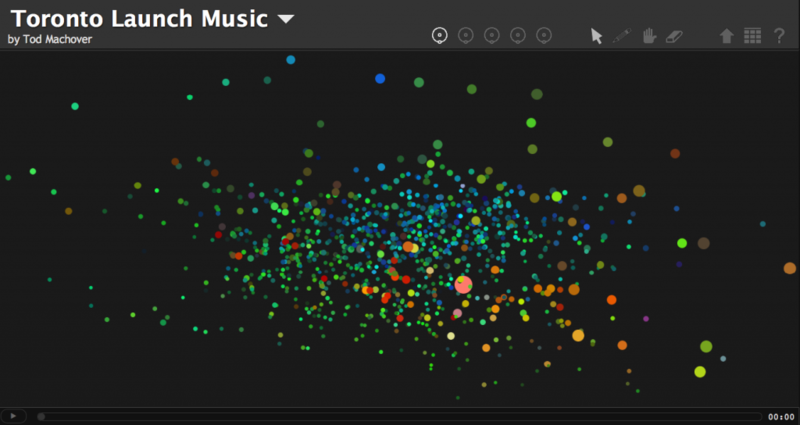 It has a truly fun – and, honestly, somewhat addictive – interface that lets you move the mouse over clouds of bubbles to create “constellations” of beautiful sounds. These constellations are recorded, can be played back, and become your musical “score” made from this material. Using the Constellation app, you’ll find three very different “galaxies” of sounds with which to create your versions. “Toronto Sounds” accesses part of the vast database we have been collecting of sounds recorded throughout the city; play with them, combine them, and listen carefully to see if you can tell where the sounds come from. “Launch Music” takes the “overture” to the symphony – recorded by musicians from the TSO – and gives you access to its many diverse sounds and textures. (Playing with this is a particular favorite of mine.) And “Toronto Chords” lets you play with the underlying chord progression for the whole piece, the kind of skeleton or genetic code which will help lend coherence to the vastly diverse materials and voices which are coming together to form this sonic portrait of Toronto. I am now in the final stages of listening to and considering all of the sounds and music that you have sent me over the past months, combining that with my own “Toronto Music” that I have been imagining. Everything that you create with the Constellation app will be considered for use in many sections of the piece. I’ll let you know how and where over the coming weeks. In the meantime, please enjoy creating with Constellation and Media Scores. And stay tuned for one more fun activity, an opportunity to shape one of the major melodic sections of the piece using a special version of Peter Torpey’s Media Scores, to be launched next week. Thanks to all for your collaboration, and – as always – send me any comments or questions about A Toronto Symphony, as well as your wonderful musical ideas!!! This entry was posted in Tasks and tagged creative collaboration, MIT Media Lab, music apps, musical collaboration, musical compostion by june. Bookmark the permalink.